Politicking in his boyhood home, President Barack Obama told supporters Monday that everything they worked for and that the country stands for is on the line in his 2012 re-election bid, warning of a bleak America should a Republican win. Associated Press. Early indications are the Asia-Pacific Economic Cooperation conference might not have drawn 20,000 visitors nor added $165 million to the economy as forecast, but it likely gave Hawaii something of more value: a new image. Star-Advertiser. President Barack Obama announced on Monday at a campaign fundraiser on Oahu's Leeward Coast that his wife Michelle and daughters Malia, 13, and Sasha, 9, will be returning "shortly" to Hawaii during the Christmas and New Years holiday - and he hopes to join them as well. Hawaii Reporter. 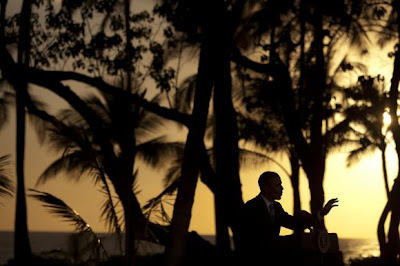 After spending three days in Hawaii, President Barack Obama is expected to depart the islands at about 8:30 a.m. Tuesday. Hawaii News Now. Coming back to Hawaii was more than just a stop for high-level diplomacy for President Barack Obama. Star-Advertiser. First lady Michelle Obama spent her last day in Hawaii Monday promoting a nationwide effort to help veterans and military spouses find jobs in a speech at a job fair at Joint Base Pearl Harbor-Hickam. Pacific Business News. First Lady Michelle Obama met veterans and military families today at Joint Base Pearl Harbor-Hickam. Hawaii Public Radio. A state judge ruled Monday that Gov. Neil Abercrombie must disclose the names on Judicial Selection Commission candidate lists used to make appointments.Star-Advertiser. It was nearly a year ago that Gov. Neil Abercrombie appointed Sabrina McKenna to the Hawaii Supreme Court without revealing the other finalists for the job. Civil Beat. The achievement gap between Hawaii's public school special education students and their peers is wider than the national average, partially because they are isolated more than they should be, an evaluation agency reported this week. Civil Beat. A new report that raises questions about the transparency of special-education funding and argues there are "strong disincentives" for moving disabled students into general-education classrooms will be used as a guidebook for making big changes through the coming year as to how special-education services are administered, state officials said. Star-Advertiser. APEC helps local business land big deal. KHON2. The Ka Pua project, initially proposed for Makaha Valley, is now being considered for Maili on land owned by the Department of Hawaiian Homelands. KITV4. Hawaii Medical Center said it has found a new lender and potential buyer, averting the possibility that the bankrupt operator of hospitals in Liliha and Ewa, formerly known as St. Francis, will have to shut down. Star-Advertiser. Roughly 18 months after Hawaii County failed to attract a single purchase offer for its Paauilo properties, its attempt to lease the 718 acres of former sugar cane land has generated more than 40 requests. Tribune-Herald. Banyan's Beach in North Kona has surfed to the top of the priority list for county acquisition next year. West Hawaii Today. The site of a massive proposed wind farm in West Lanai where hundreds of archaeological and cultural sites have been identified has been named one of the state's "most endangered historic places" for 2011 by the Historic Hawaii Foundation. Maui News. Purchasing and rehabilitating foreclosed homes, developing "clean and sober" rental units and renovating affordable apartments in Wailuku are among the projects proposed for the county's Affordable Housing Fund this year. Maui News. The type of treatment an addict pursues often reflects the willingness to overcome the addiction with support, experts say. Garden Island.